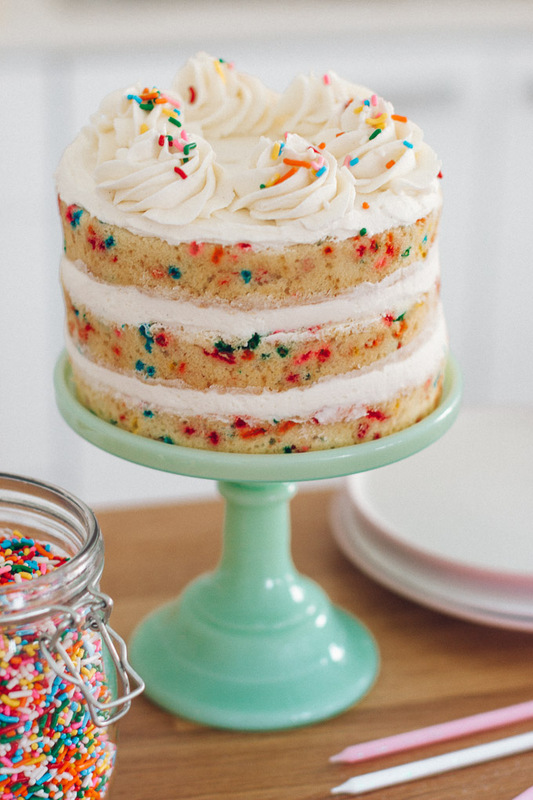 If you have a celebration coming up, this funfetti cake recipe is for you. 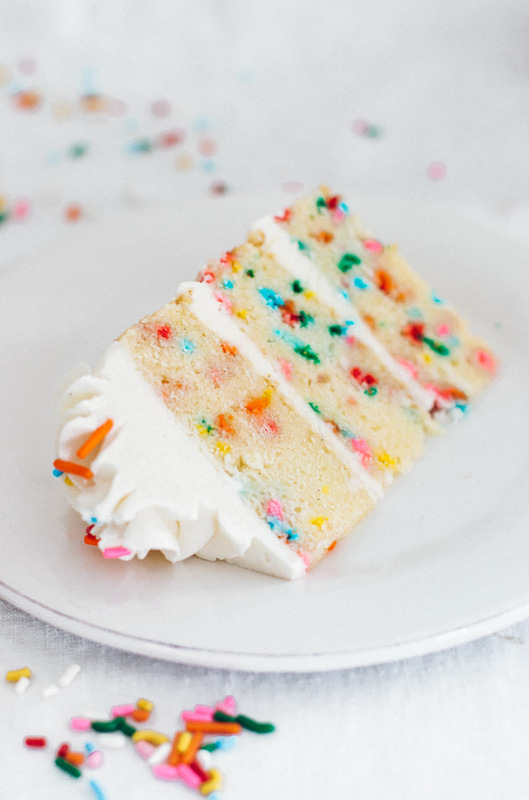 Fluffy and moist vanilla cake layers dotted with sprinkles and frosted with a super creamy vanilla buttercream. 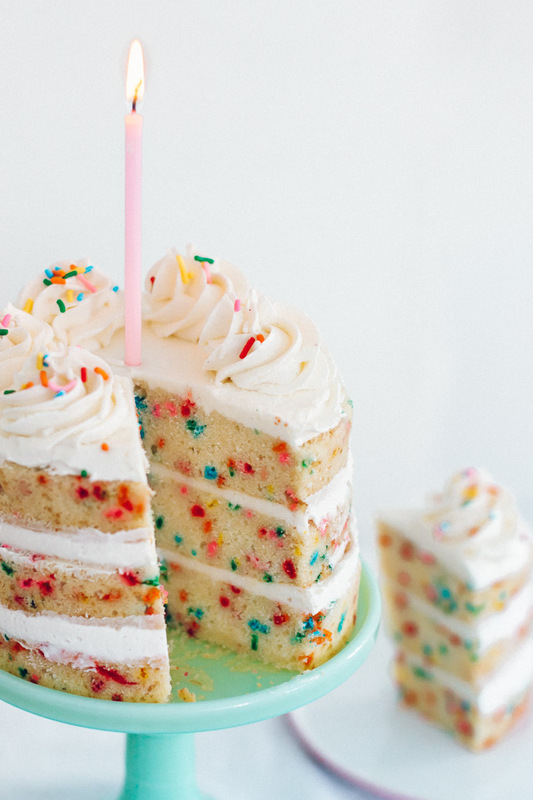 It’s the best funfetti cake ever, and you can learn how to make it from scratch with this detailed recipe. 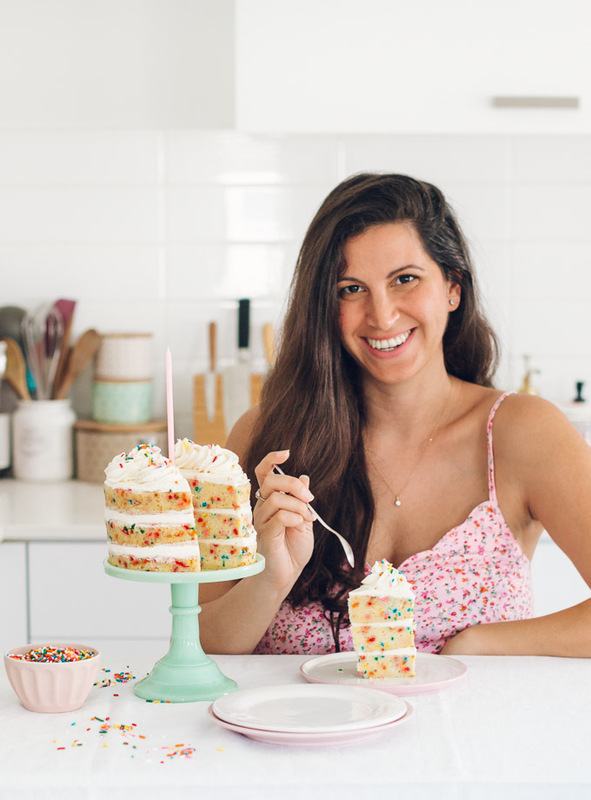 Last week was my birthday and if you follow me on Instagram then you know that I like to celebrate my birthday like a 5 year old girl – with lots of sprinkles and pink vibes. Every year I make a chocolate cake for myself but this year I wanted something extra special so I made a festive funfetti birthday cake. I made a mini 6-inch cake although the recipe I’m sharing is for a 9-inch cake, a more common cake size (for a 6-inch cake I cut the cake ingredients by half and slightly reduced the baking time). It was the best week ever, filled with food and love from family and friends. If you’ve read my white cake post, then you know I’ve been trying lots of different vanilla cake recipes lately. 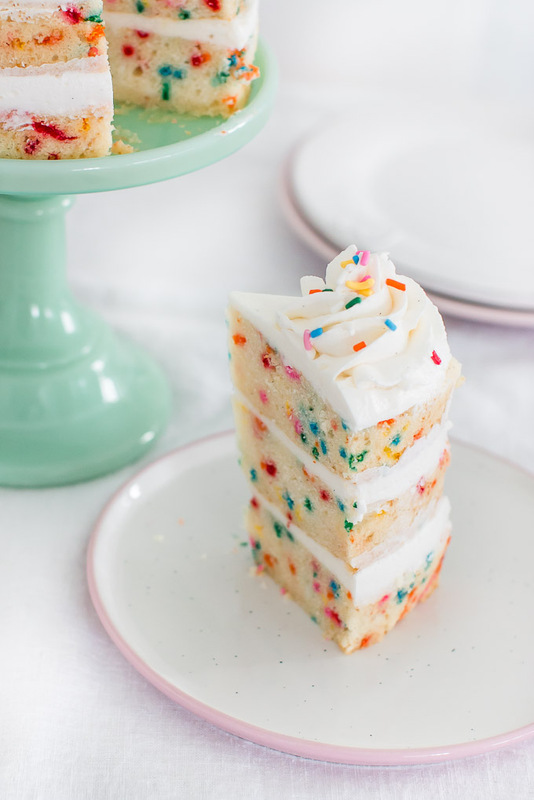 I’ve been looking for great white cakes and butter cakes, and the recipe I’m sharing today is the perfect match for this sprinkle cake, and the batter is easy to make. If you prefer a white cake, you can use my other recipe and add 3/4 cup sprinkles to the batter. I don’t think I need to convince you that this cake is gorgeous, but it also tastes delicious. It’s fluffy, tender, moist and buttery. For the best vanilla flavor I use pure vanilla extract (not imitation vanilla extract). I use buttermilk which gives the cake a moist texture. If buttermilk isn’t available, you can (1) use 1 cup of milk plus 1/2 cup sour cream instead of the buttermilk, or (2) make homemade buttermilk: take a measuring cup and pour in 1 tablespoon of white vinegar or fresh lemon juice. Add milk until it reaches one cup. Stir and let sit for 5 minutes. It will look curdled and that’s ok. Probably the most important ingredient in this recipe is sprinkles. The best kind of sprinkles to use in cakes and cookies is jimmies and circle quins. I used these sprinkles. They don’t bleed to the batter and I like their popping colors and tasty flavor. I use my vanilla buttercream frosting because it’s a classic combination. For a less sweet frosting you can use cream cheese frosting or chocolate fudge frosting. If you have leftover frosting you can decorate the top of the cake as you wish. Preheat oven to 350°F/180 °C. Butter three 9-inch cake pans that are at least 2-inch high, and line the bottoms with parchment paper. 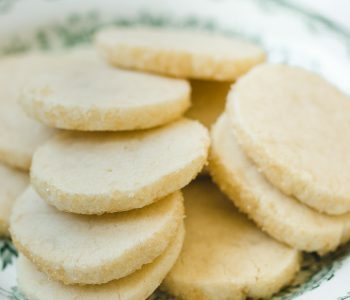 In the bowl of an electric mixer fitted with the paddle attachment, beat butter and sugar on medium speed until light and fluffy, 3-4 minutes. Scrape down the sides and bottom of the bowl as needed. Add eggs, one at a time, beating well after each addition. Beat in vanilla extract. With the mixer on low speed, add the flour mixture in three additions alternating with the buttermilk in two additions, beginning and ending with the flour mixture. Do not overmix this batter. The less you mix, the lighter the cake will be. Fold in sprinkles. Divide batter evenly between prepared pans. Bake for 25-30 minutes until a toothpick inserted into the center of the cakes comes out clean. Allow cakes to cool for 15 minutes, then gently remove from pan and allow them to cool completely on a wire rack. Frosting: In the bowl of an electric mixer fitted with the paddle attachment, beat butter and salt on medium speed until smooth and creamy, about 2 minutes. Add 5 cups powdered sugar, heavy cream, and vanilla. Beat on low speed for 30 seconds, then increase speed to high and beat for 2 minutes. Beat in more powdered sugar if frosting is too thin. Assembly: If the cakes rose too much, cut their rounded top with a knife to make them flat. Set one cake layer on a plate or cake stand. Evenly spread a thick layer of the frosting over the cake to the edge. Top with the second cake layer and spread a thick layer of the frosting. Finish with the third cake layer. Spread frosting over the top and sides of the cake. Cake should be kept in the fridge, but bring it to room temperature before serving. Frosting can be made 3 days ahead of time and kept in the fridge, covered. Cakes (unfrosted) can be made a day ahead and kept in the fridge, covered. The next day, bring frosting to room temperature and frost the cake. Frosted cake can be kept tightly covered in the fridge for 3-4 days. 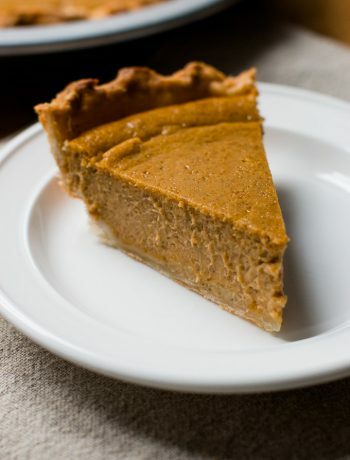 Leftovers can be kept in the freezer for up to 2 months and thawed overnight in the fridge. When you halved recipe for 6” tins, how many eggs did you use? Hi Kim, you can use 3 medium eggs, or 2.5 large eggs. The half egg can be measured out by whisking an egg and using only half of it. The recipe is best for a 3-layer cake. If you make 2 layers, they will be taller and will need extra baking time. How can I turn this into a chocolate confetti cake? (As in adjusting flour, coco powder, and sugar?) My daughter always requests a chocolate cake with sprinkles, never a vanilla. 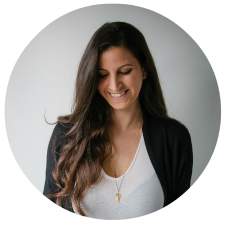 Also, happy belated birthday to my favorite baking blogger!!! Thank you so much, Nabila!! Since chocolate cakes are dark, it’s hard to see the sprinkles inside the cake, that’s why it’s always vanilla cake. 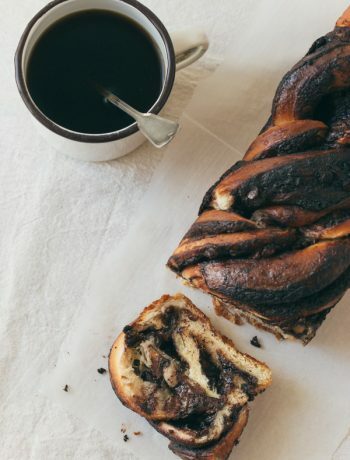 for sharing this recipe! And Happy Belated Birthday! ? When do you add the sprinklers in to the batter, please? Once all the ingredients are mixed, fold in the sprinkles into the batter. how much 1 cup sprinkle in gram? can i leave out the sprinkle to make vanilla cake? I don’t know exactly how much grams are in a cup of sprinkles. 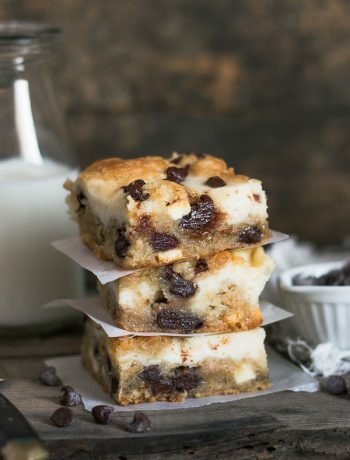 You can leave it out or use chocolate chips. Can I turn this cake into cupcakes? How many cupcakes would it make? I recommend using the vanilla cupcake recipe and add sprinkles to it. Since I have one pan and one small oven, can you let me know the quantity for one baking one layer at time? Do I quater the recipe? It depends on the size of your pan and how tall it is. Make sure to fill the cake pan no more than 2/3-3/4 full with cake batter. There are three layers in the recipe so you can do this three times if you’re using the same pan size (9-inch), or twice to make a two layer cake. Which brand of sprinkles do you use? Yours have a good colours I’m worried about buying just any brand and them not showing up well. Hi Emily, there’s a link in the post above. These are the sprinkles I used. How high is the cake once assembled? I don’t know exactly, sorry! Hi there can you swap the sprinkles for popping candy in the batter? would it work well? Hi Lisa, I haven’t tried using popping candy, but in general, you can replace the sprinkles with any other add-in you like. Hi! If making this cake in a 9X13 do you know how to adjust for bake time/oven temp? Hi Brianna, I don’t know what’s the exact baking time, but the temperature will be the same. 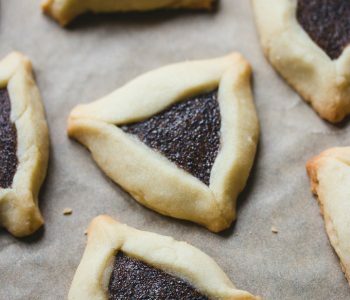 What substitute can i used for buttermilk please ? 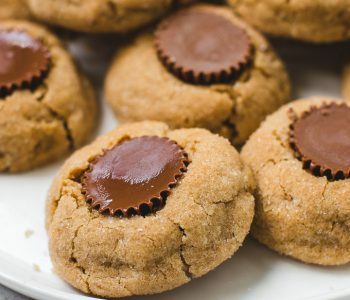 I do not have a standing mixer, will a hand mixer work for this recipe ? Can I use 8” cake pans instead? Yes, just make sure not to fill them with too much batter, so it won’t overflow during baking. Hi – the edges of your cake look so good! Did you shave the edges off so they weren’t browned from the pan? I used cake strips. It does the trick! Hi came a cross your recipe i have only got two 12 inch round cake tins. Do I need to double the recipe to use the 12 inch cake tins. Do you think I could make the same amount of batter for 3 6″ tins, but use 2 layers in 9″ tins instead? Thank you!! Eager to try this. Hi Mary. For a 6-inch cake you’ll need to use half the amount of ingredients. This recipe is best for a 3-layer cake. If you make 2 layers, they will be taller and need extra baking time. 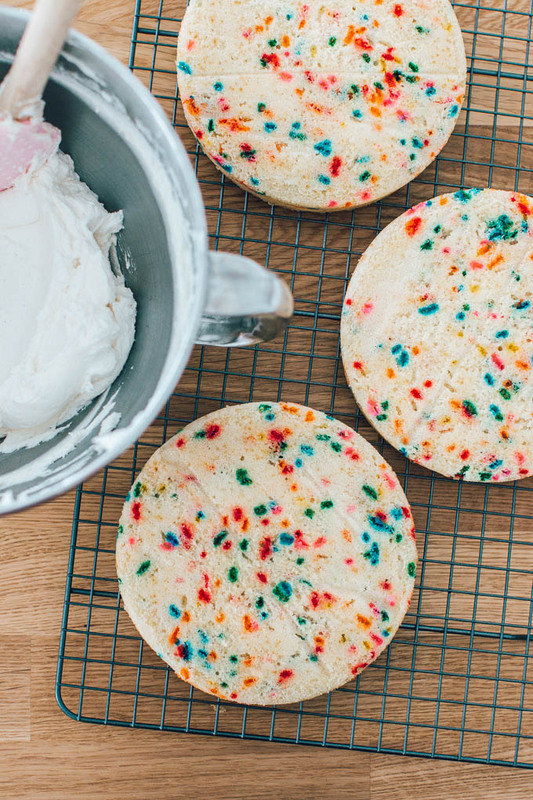 Tried this and it was my first time making Funfetti. Sooo good!! Hi, I’m making a cake for my friend’s wedding, but she wants four 9 inch layers. How should i go about changing this recipe to fit those four 9 inch layers? You can use this recipe to make 4 layers, or multiply the recipe as you wish to make a taller cake. I just wanna say thanks for you actually taking the time to put the measurements in grams and milliliters and the temperatures in Celsius. As a non- American, this is super important to me when following a recipe. Thank you. 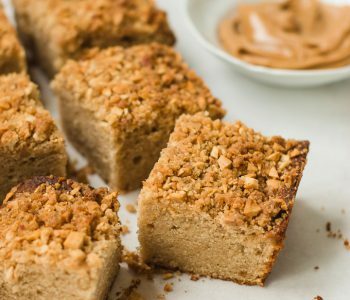 Best recipe I’ve used and I’m a very picky baker! I hadn’t baked a cake in awhile, usually cupcakes is my norm. 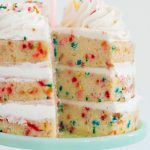 But, my friend requested a “Funfetti Cake” for his 34th birthday (store bought box mix tastes like my childhood which I love but I just can’t) so I looked up a new recipe to try from scratch. I followed it perfectly except I baked an addition 15 minutes due to my oven. THIS CAKE WAS AMAZING. I cooled the cakes, chilled the frosting a bit and when I frosted it all I put it back in the fridge. By the time we ate it, it was harder but not so much so you couldn’t eat it right away. Perfection. Not too sweet. The stiffness from having it in the fridge actually enhanced it. Also made it look pretty when it was cut because the slice was perfect. I’ll be using this for any and all future (white) cakes! Thank you! Hi I only have one 7-inch pan will the recipe still work or will I have to do four layers? I recommend 4 layers, and the cake will be taller. I made this and got rave reviews. 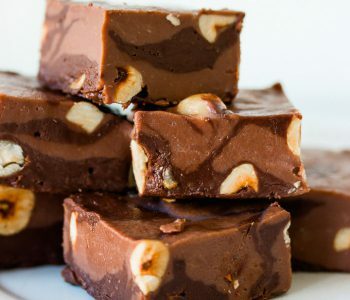 My husband loved it and he usually hates most desserts. The cake was very moist and delicious.